This Advanced Flea Kit contains a comprehensive selection of flea-killing products and is designed to eradicate a heavy or widespread cat or dog flea infestation in an average-size property. Maintains long-lasting flea control for up to 12 weeks! Contains natural powder safe for treating pet bedding. This Flea Kit contains sufficient insecticide to control a flea infestation in an average 3-bedroom house. The combination of products will enable you to carry out a professional flea treatment, eradicate dog or cat fleas in your home and maintain long-lasting fleacontrol. 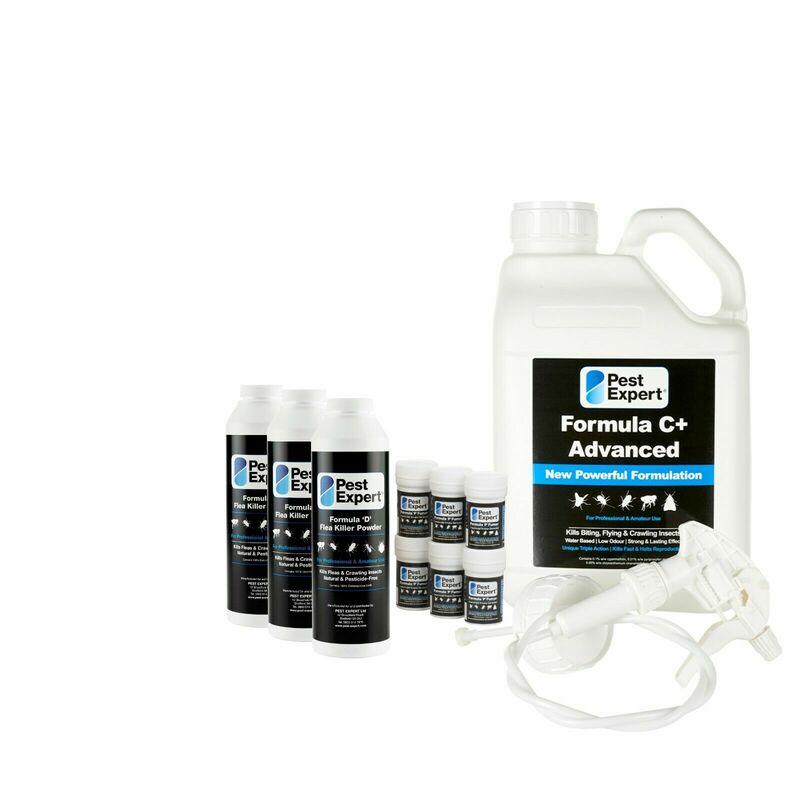 Our Kits include our best-selling insecticide Pest Expert Formula 'C' Flea Spray which as well as killing on contact also offers long-lasting protection. Also supplied is a twinpack of Formula 'P' Flea Bombs for fumigating the room and some Formula 'D' Flea Powder – a natural, pesticide-free flea killer that is safe enough to treat pet bedding. 1 x 5 litre Pest Expert Formula 'C' Flea Spray: A highly-effective insecticide that offers both fast-acting and long-lasting control as it leaves a protective residue that continues to kill cat and dog fleas for up to 12 weeks after treatment. A 5-litre container will treat approx 100 sq m and it can be applied directly to carpets. 3 x Formula 'D' Flea Powder: A completely natural flea-killing insecticide - diatomaceous earth - that is ideal for use in areas where a spray is unsuitable, e.g around electrical appliances and power points. Pesticide-free, it is perfectly safe for use in homes with children and pets and can even be used to treat pet bedding. 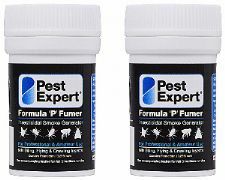 6 x Pest Expert Formula 'P' Flea Bombs: A highly effective fumigation device. After lighting, the Bomb releases a permethrin smoke which fumigates a room, killing adult dog and cat fleas. One twin pack will treat an average-size room (4m x 3m). 1 x Pressure Sprayer: Enables even distribution of the Formula 'C' insecticide, helping you achieve a thorough, professional application. Faster and easier to use than a hand-held trigger spray when treating large areas. 1 x Protective Coveralls, Safety Mask & Gloves: Offer excellent body, airway and hand protection to the user when carrying out an insecticidal treatment. All our Flea Kits are supplied with a professional advice sheet containing step-by-step instructions on how to use the products to carry out a successful treatment. Treatment of the home should always be carried out alongside treatment of your pet(s), if this is the source of the infestation. Always see a qualified veterinarian for advice on the best flea products to treat your pet. Great products and good service! Recommend this company to anyone. Good prices, effective products and quick delivery !! Having used Pest-Experts fantastic rat poison before I had no issue with going to them for my flea products! As I thought, the products worked fantastically! Fast delivery. Fast acting. I cannot fault the service and products within the kit! Excellent service very fast delivery just what I required will use again! Have and will continue to recommend Pest-Expert - their products really do work! This kit nuked all the fleas across by 4 bedroom house! Thank you so much! Our cat seems the happiest out of all of us!